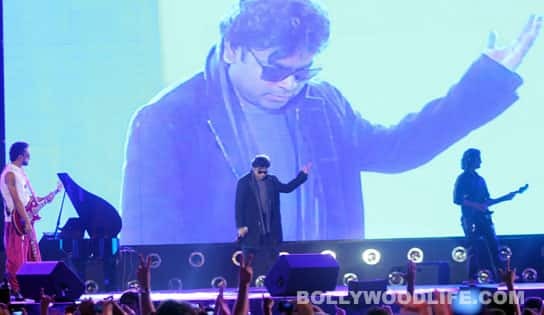 Did we need any particular reason to celebrate the genius of our own Oscar-winner AR Rahman? No? Thought not. The revered German orchestra Babelsberg is hitting Indian shores for a concert tour featuring the music of the Chennai Chopin. Commencing January 20 in Mumbai, the ‘Germany and India: 2011-2012: Infinite Opportunities’ concert tour will move on to Delhi, Chennai, Kolkata and Bangalore. Fittingly, the tour will celebrate two centenaries – that of Babelsberg and of Indian cinema. As you can imagine, this won’t be your standard concert with star playback singers. Rather, German musicians alongside students of Rahman’s KM Conservatory will serve up orchestral versions of Rahman tunes from Bombay, Swades, The Rising: Ballad of Mangal Panday, Elizabeth: The Golden Age, Roja, Endhiran, Dil Se and many others. The eclectic choice is thanks to Rahman collaborator Matt Dunkley. Meanwhile, it has been brought to Cineswami’s attention that, gasp, Abhishek Bachchan was booted out of Lucknow airport’s VIP lounge. AB junior not a VIP? Gasp. What a surprise… not. What’s really surprising is that Lucknow airport has a VIP lounge in the first place. Be that as it may, plaudits to the good folks there for recognising AB’s baby’s total non-entity status. We will happily eat our words when or rather more pertinently, if, Abhishek delivers a solo hit. Even C-listers like Abhay Deol have more cachet than the Amitabh scion these days. That’s why he’s hanging out with southern star Dhanush these days, hoping that some of the Kolaveri di magic will rub off on him. Lest he forgets, let’s remind Abhishek that Dhanush is not just a song fluke; he’s a seasoned actor who’s won a National Award for his pains. Now that all the brouhaha over foreign direct investment in the retail sector has died down a bit, Cineswami is compelled to ask: Isn’t selling cinema tickets a form of retail as well? Should the definition of retail be just limited to buying consumer durables? The reason this question is being posed is that Latin American multiplex giant Cinepolis is making quiet inroads into India. Beginning earlier this year with just four screens, the chain now has 32 across Bangalore, Ahmedabad, Amritsar, Patna and Surat. Watch this space, these guys are going to be major players.